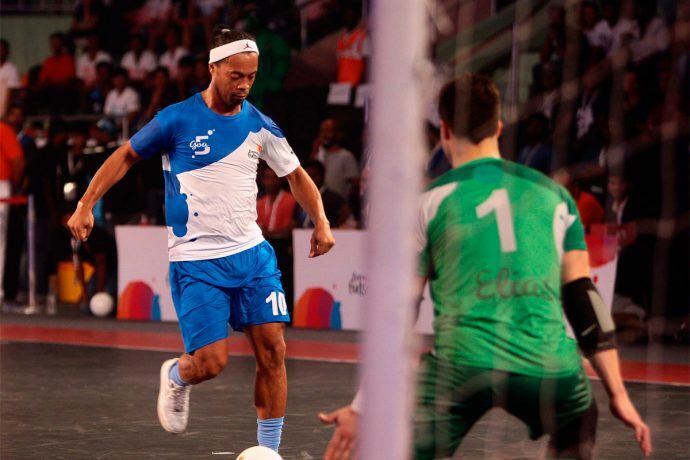 The Goa franchise legend Ronaldinho has expressed his regret at having to leave Premier Futsal ahead of the Goa leg of the tournament beginning July 19. A few days back, Ronaldinho was informed that he has been chosen as the ambassador of the 2016 Paralympics in Brazil and requested the organisers’ permission to leave the tournament midway to honour the position he was offered. The Premier Futsal management is committed to have a long-term association with Ronaldinho and took his request into consideration, before allowing him permission to leave. While the league is disappointed at having Goa’s legend miss out on playing in front of his home fans, they are pleased to announce the signing of another Seleção legend and the captain of arguably one of the most successful Brazilian national teams, Cafu, as a replacement to lead the Goa franchise. Owing to Cafu’s delayed arrival, and to allow the Goan futsal fans to see their new captain in action, the league rescheduled a few games.